I often draw cartoons in support of freedom of expression and human rights. My cartoons have been shared across social media and have appeared in the Washington Post, The Guardian and many other publications. Left/Right: Nasrin Sotoudeh is a prominent Iranian human rights lawyer who defended women protesting against forced hijab and has been detained and sentenced to 5 years in prison. Atena Farghadani is an Iranian artist and political activist, who was considered a prisoner of conscious by Amnesty International. She was imprisoned for a cartoon that she drew, in 2015. 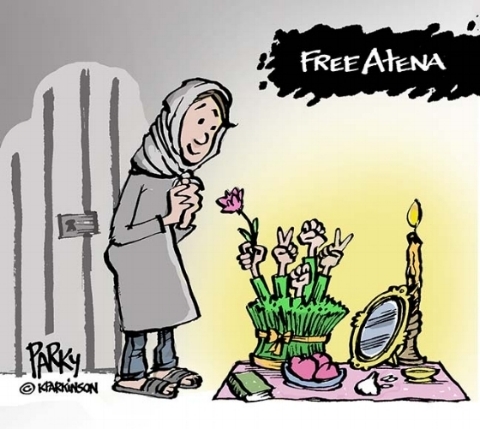 The #draw4atena hashtag was created and cartoonists around the world began sharing their cartoons across social media to help raise awareness of her case. My cartoons were published in the Washington Post, The Guardian, Amnesty International and other media. EatenFish: Ali Durrani is a young Iranian man who was detained on Manus Island for nearly four years. During his detention cartoonists supported him by creating and sharing cartoons. He is now living in Norway.